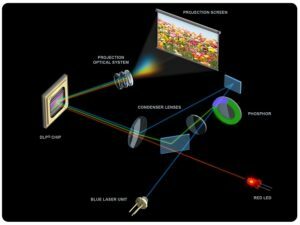 Just when we thought that digital cinema technology has arrived, I couldn’t believe my eyes when I read an article in The Hollywood Reporter that Imax has pacted with Barco to develop new laser projection technology. IMAX is a Canadian Theatre company founded in 1968. They are responsible for designing and manufacturing IMAX cameras and projection systems as well as film development strategizing. Barco NV is a Belgian company that caters to 3 markets. They are enterprise, healthcare, and entertainment. On the entertainment section of this multi-million dollar corporation, they have state of the art projectors as one of their main product. Interested in your feedback…..is it just a gimmick or will this be here to stay??? I saw a version of this new technology recently at Mitsubishi in Singapore used in a large screen TV/display panel. In presentation, it was a bit of a throw-back to the older projection/CRT format where there apparently needs to be a projection angle on the laser to project on the back of a translucent screen. So the screen was actually quite deep comparted with today's super thin LCD/LED display panels. Accroding to the Mitsubishi techs, the images are supposed to be sharper and the colour tones more life-like. To be honest, I couldn't really tell the difference, but I suspect it would have a lot to do with the source material being displayed. I think they had normal resolution DVD content playing, so the images would likely be no better than other display technologies. Potentially, with much higher resolution content and more colouration information in the data, the images would come out even better. What's clear is that the techology for using laser to project high quality images works. What's not clear is if it will be sufficiently better or cheaper than today's digital projectors to warrant adoption.